I will be the first to admit that I have been on a little bit of a soup kick this fall and winter. I love a big bowl of soup for lunch when the weather turns colder. Since we’ve had a few days of cooler temperatures, I decided to make another pot of soup. 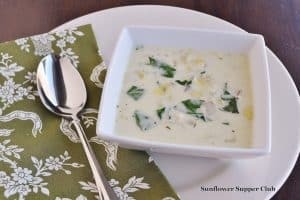 As I’ve said before, we love Spinach and Artichoke Dip around here, and this has similar flavors. Although the recipe calls for chicken, you could certainly leave it out and use the soup as a first course. In a Dutch Oven or large heavy pot melt butter and heat olive oil over medium heat. Add onion, celery, mushrooms, salt and pepper. Sauté for 8-10 minutes until vegetables are soft. Add the chopped artichokes and garlic and sauté for a couple of minutes. Add the wine to deglaze the pan, be sure to scrape anything from the bottom of the pot. Add the flour and continue cooking for 2 minutes. Slowly add the Chicken Broth a little at a time. Add the tarragon and thyme and bring to a boil. Reduce the heat to a simmer. Add the heavy cream a little at a time maintaining a simmer. Simmer for 15-20 minutes until thickened. Stir in the Spinach and the chicken, continue simmering for 5 minutes. Remove from heat and stir in Parmesan Cheese. Salt and Pepper to taste.